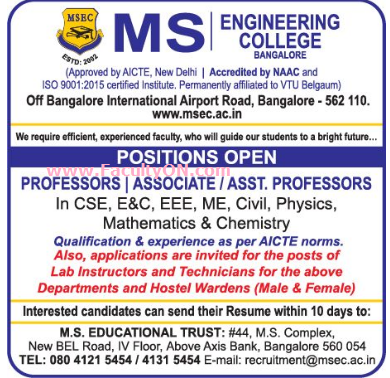 MS Engineering College, Bangalore has advertised in DECCAN HERALD newspaper for the recruitment of Teaching Faculty- Professor / Associate Professor / Assistant Professor Plus Non-Faculty jobs vacancies. Interested and eligible job aspirants are requested to apply within 10 days from 20th June 2018. Check out further more details below. About College: M. S. Engineering College is a Bengaluru based Engineering College promoted by M. S. Educational Trust. The college offers quality Education to students to achieve their goals of becoming much sought after professionals. Spread over an area of 25 acres, M. S. Engineering College is equipped with the best of infrastructure and has highly accomplished professionals who form part of the teaching and the administrative staff. Reference: Advertisement from MS Engineering College, Bangalore on DECCAN HERALD newspaper dated 20th June 2018 for the recruitment of vacancy position such as Professor / Associate Professor / Assistant Professor and non-teaching faculty jobs. See the copy of advt below.